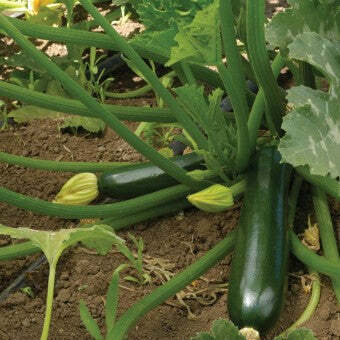 The first two weeks of May is the ideal time window for starting squash seeds (including zucchini and pumpkin) indoors. By starting the seeds indoors, there is less risk of the seedlings being damaged during their most vulnerable early weeks. These plants transplant well, so it may be easier to achieve perfect spacing by starting seedlings indoors. I recommend starting one seed per cell in the fairly large 12-Cell Plug Inserts, using sterilized Seed Starting Soil. Provide optional bottom heat by using a Seed Heating Mat for faster and more even germination. As soon as the seedlings germinate (in 7 to 14 days), get them under bright artificial light and if you’re using one, remove or unplug the Seed Heating Mat. 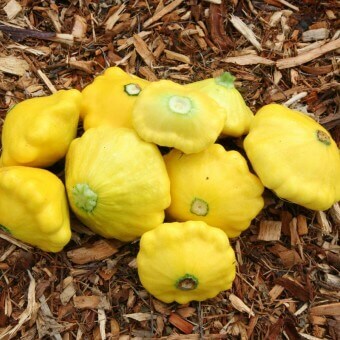 This will encourage stout, compact growth and the best start for squash seedlings. Because the cells in the 12 Cell Insert are quite large, you should not need to transplant squash seedlings until transplant time at the end of the month or in early June. Transplant time depends entirely on when the soil has warmed up outside in your area, but try to get them into the ground by June 15th. Transplant them into rich, fertile soil. I like to use a good handful (approximately one cup) of 4-4-4 Complete Organic Fertilizer mixed into the soil beneath each transplant. This will be ample for most squash plants, except the really giant pumpkins that require yards of extra compost, careful pruning, and foliar feeding. In 2012 I had the opportunity to grow out all of our squash varieties, side by side in raised beds at our local community garden. The volume of fruits produce led to some quite surreal moments! While this wasn’t an official seed trial, it did provide some insight into the comparative growth rates, productivity, and sheer size between one plant and another. Plus we gorged on squash all summer and fall. Below are some of my recommendations. Please read more About Squash here. Festival is the acorn squash for me. I don’t eat a lot of acorn squash, but this one has a sweet flavour, a bit like the Delicata group… Almost like sweet potato, but with firmer flesh. The plants are not enormous, and each produces five or six fruits. The unique markings on the fruits develop over several weeks, and no two are alike. The golden yellow develops last, and probably indicates ripeness. Harvest the fruits with care not to damage the skin, and wipe them down with a weak bleach/water solution. This will kill off any bacteria on the skin and they will keep for two or three months. 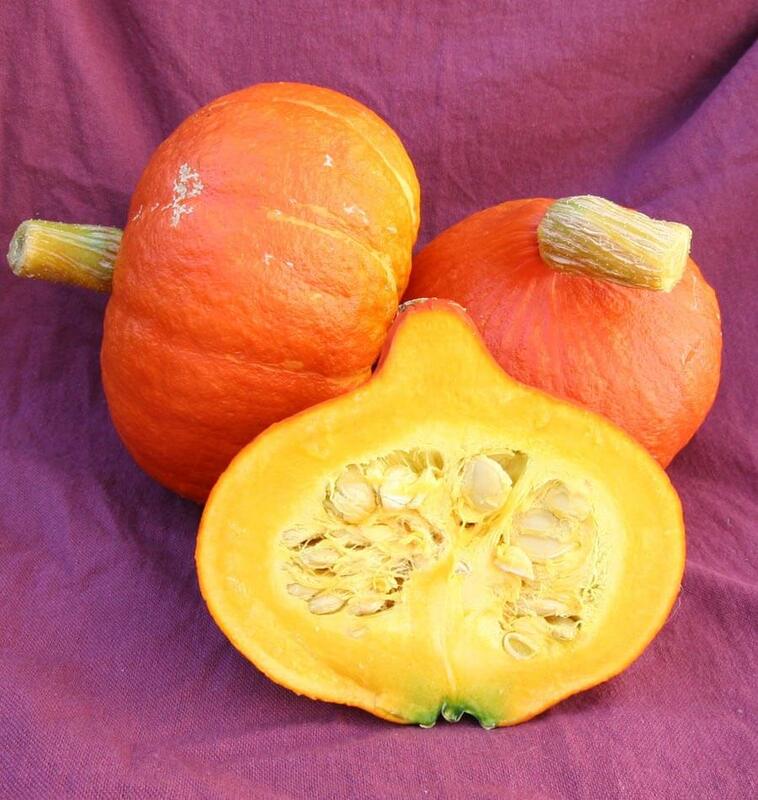 Discover Kabocha squash! These “Japanese pumpkins” come in bright reddish orange like the Kuri group. Uchiki Red Kuri is a certified organic variety with smallish, bulbous shaped fruits with large seed cavities and sweet flesh. This is the perfect squash for thinly sliced, fried tempura wedges. Our plants each produced two to three fruits, but the plants were finished by mid-September from May sowing. First Taste is a hybrid kabocha with larger fruits that are extremely attractive in dark green with blue/grey longitudinal stripes. 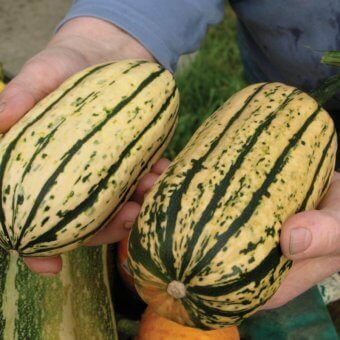 You may have seen Delicata squash turning up in grocery stores in recent years, but they are very easy to grow. Frequently described as tasting like sweet potato, they boast an incredibly long shelf life, well into winter. Bush Delicata is the best choice for smaller gardens, as the plants stay relatively compact (for squashes! 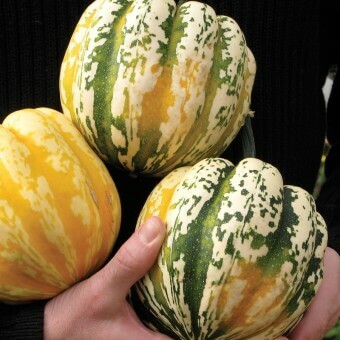 ), producing plump white fruits with dark green longitudinal stripes and some attractive speckling. The first time you spy the exceptional French heirloom, Galeux d’Eysines, you may be reminded of deep sea creatures or cheap science fiction props. It’s definitely a pumpkin, but its skin is distinctly pink, not orange. And its whole surface becomes covered with odd warts that are woody in texture, a bit like peanuts. The warts appear to signal ripeness, and coincide with the highest sugar content in the delectable orange flesh. 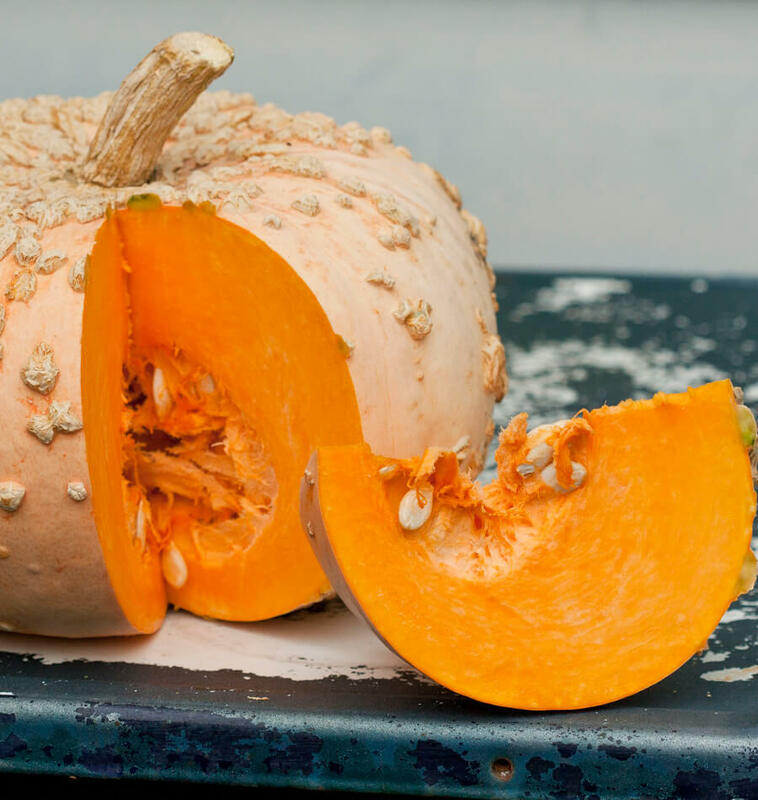 The seed cavity is small for a pumpkin, and the flesh has low fibre content, making it excellent for Pumpkin Pie from Scratch. 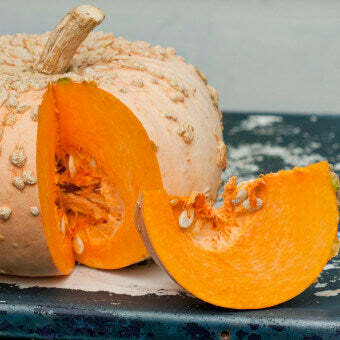 Another personal favourite pumpkin is the other classic French heirloom Rouge vif d’Etampes – also great for pies. But this is a better selection if you have lots of room. A well fed plant can reach thirty feet across, producing only 3 quite large fruits. 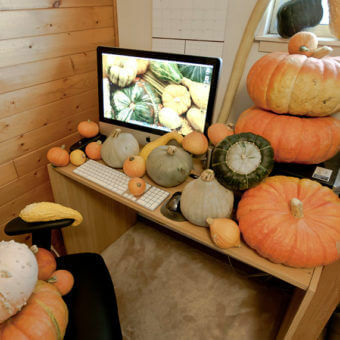 So far, I have only mentioned the so-called winter squash, those that will store for fall and winter meals. Summer squash describes scallopini squash, zucchinis, and marrows that are ready for eating in the summer, and seem to come in nearly endless supply. 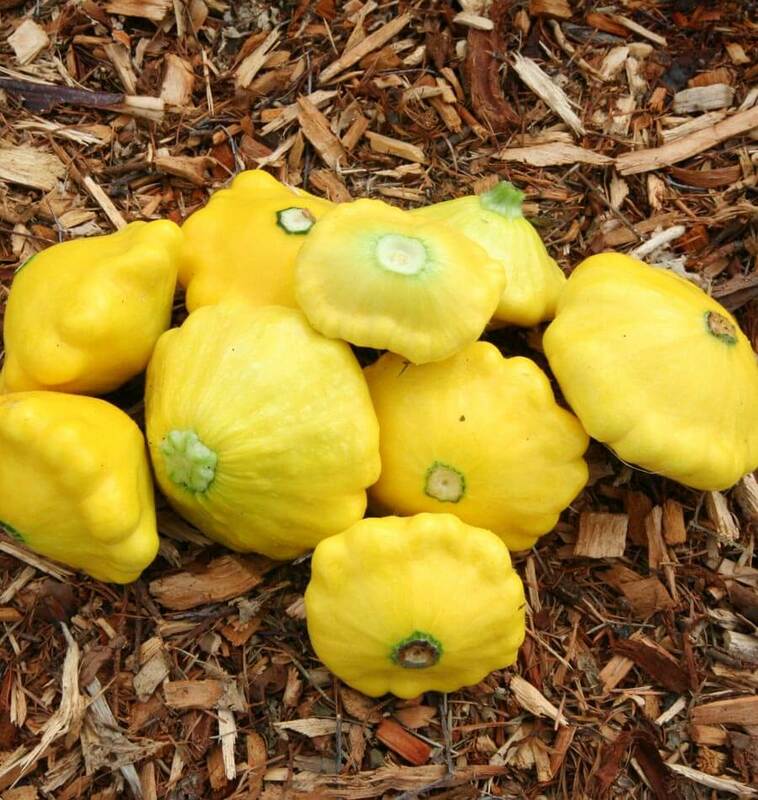 For eating, summer squash are best harvested at a small, immature size, before their seeds develop and the flesh becomes stringy. The plant’s efforts to produce seeds are thwarted by regular harvesting, so it just keeps producing more flowers and fruits. Sunburst (shown above) is my favourite of the scallopini varieties. Its hybrid vigour make it extremely productive. The photo shows a typical day’s harvest from three plants during peak production, so one plant is enough for most small gardens. Sunburst has a neutral flavour, but its texture is tender and succulent. I like to harvest them within a day of flower fertilization, when the fruits are tender and perfect… So good grilled or briefly sautéed with butter and herbs! As far as zucchinis go, Black Beauty remains a favourite of mine. The plants are reliable, and the smooth fruits have an appealing, mild flavour. Like all summer squashes, it’s wise to limit the number of plants unless you REALLY like zucchinis! Expect a fruit every day per plant for several weeks of summer production. For a bit stronger “true” zucchini flavour, nothing beats the Italian heirloom Romanesco, with its distinctive ridged stripes. Try harvesting some of the female flowers early in the morning, just as they open. Keep the unfertilized ovary of the plant attached and stuff the flower with a spoonful of goat cheese and herbs. Briefly fry in some olive oil and butter for the ultimate Mediterranean breakfast! If you’re at a loss on how to prepare all these summer zucchinis, please try out my Masala Zucchini recipe, which takes these mild summer fruits to a whole new level of flavour and texture. Serve it with other Indian dishes, or as a surprising side dish for summer meals. 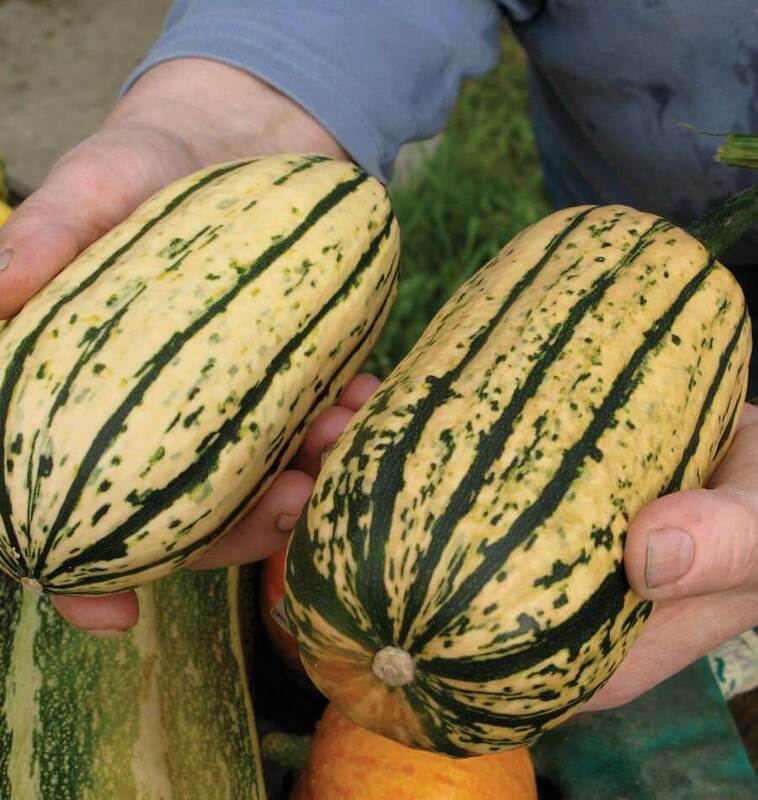 So please remember to plant your squash seeds soon – before May 15th indoors for the best results. 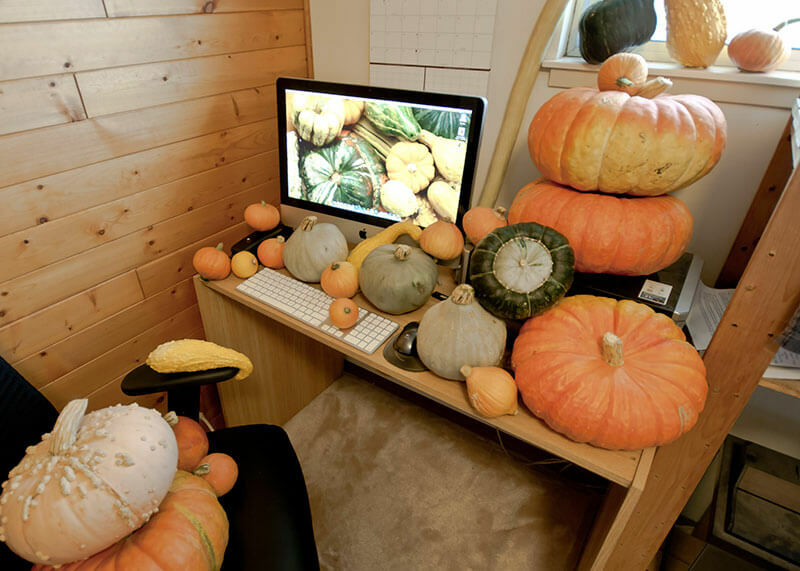 Or continue reading on How to Grow Squash.